The following documents are available in pdf format by clicking on them. Please note that they are large files and will take some time to load in your browser. Schmidt, CE, Ron Sahu, Mark Jones, Kevin Kiefer, "Comparison of Measured Flux Versus Modeled Flux of VOCs from a Groundwater Source- Case Study with Side-by-Side Flux and Soil Gas Measurements," AWMA Symposium on Air Quality Measurement Methods and Technology, Los Angeles, CA, November 2010. Schmidt, CE, Peter Green, et. al., "Assessing Ozone Reactivity Emissions from a Biofilter at a Compost Facility Using the SCAQMD Modified USEPA Surface Flux Chamber Technology and the UC Davis Mobile Ozone Chamber," AWMA Symposium on Air Quality Measurement Methods and Technology, Los Angeles, CA, November 2010. Schmidt, CE, Tom Card, Steve Hoyt, Lorrie Loder, "Assessing Air Emissions of VOCs, Ammonia, Fixed Gases, and Siloxanes from Biofilters at Compost Facilities Using the SCAQMD Modified USEPA Surface Flux Chamber Technology," AWMA Symposium on Air Quality Measurement Methods and Technology, Los Angeles, CA, November 2010. Schmidt, CE, Teri Copeland, Mark Jones, “ Land Redevelopment Case Study: Assessing Potential Health Risks Related To Vapor Intrusion of VOCs and Radon Using Static and Dynamic Flux Chambers,” AWMA Specialty Conference on Vapor Intrusion, San Diego, CA, January 2009. Schmidt, CE, TR Card, “Validation of the Modified USEPA Flux Chamber Technology for Assessing High Advective Flow Sources such as Biofilters at Compost Sites,” Paper # A446.2, Proceedings of the 101th Annual Meeting of the Air and Waste Management Association, Portland, Oregon, June, 2008. Schmidt, CE, TR Card, J Goodwin, “Validation of the Modified USEPA Flux Chamber Technology for Assessing High Advective Flow Sources such as Biofilters at Compost Sites,” 16th Annual Composting Council Conference, Oakland, California, February 2008. Schmidt, CE, Steve Hoyt, “Validation of Volatile Fatty Acid Recovery from the USEPA Surface Emission Isolation Flux Chamber Technology and USEPA Method TO-17”, AWMA Symposium on Air Quality Measurement Methods and Technology, San Francisco, California, May, 2007. Schmidt, CE., Robert Kick., “Use of Flux Chambers and Indoor Air Measurements to Evaluate Vapor Intrusion”, AWMA Specialty Conference on Vapor Intrusion, Los Angeles, CA, September 2006. Schmidt, CE, et. al., “Reactive Organic Gases and Amine Emission Estimates from Northern California Dairies: Direct Measurement Using the USEPA Surface Emission Isolation Flux Chamber”, 2006 International Conference on ‘The Future of Agriculture: Science, Stewardship, and Sustainability’, Sacramento, CA, August 2006. Schmidt, CE, et. al., “Evaluating Direct Measurement Approaches Used for Assessing Potential Air Pathway Impacts to Occupants in Structures Over Subsurface Sources”, AWMA Symposium on Air Quality Measurement Methods and Technology, San Francisco, California, April, 2005. Stelljes, Mark, CE Schmidt, “Assessing Potential Air Pathway Impacts to Occupants of Future Structures in Cold Climates Using Predictive Modeling and Surface Flux Measurements on Undeveloped Sites”, AWMA Symposium on Air Quality Measurement Methods and Technology, San Francisco, California, April, 2005. Las Vegas, Nevada, April, 2005. Kerger, Brent D., David R. Suder, CE Schmidt, DJ Paustenbach, “Airborne Exposures to Trihalomethanes from Tap Water in Homes With Refrigeration-Type and Evaporative Cooling Systems”, Journal of Toxicology and Environmental Health, Part A, 68:401-429, 2005. Mills, William, Erin Bennett, CE Schmidt, Louis Thibodeaux, “Obtaining Quantitative Vapor Emissions Estimates of Polychlorinated Biphenyls and Other Semivolatile Organic Compounds from Contaminated Sites”, Environmental Toxicology and Chemistry, Vol. 23, No. 10, pp.2457-2464, 2004. Leet, R. CE Schmidt, “Case Study- Tier 3 Assessments of Potential Risks to Occupants of an Office Building Over a Groundwater Contaminated Plume Via the Indoor Air Pathway,” Paper No. 455, Proceedings of the 97th Annual Meeting of the Air and Waste Management Association, Indianapolis, Indiana, June, 2004. Copeland, T., J. Van de Water, CE Schmidt, “Reducing Uncertainties in Health Risk Characterization, Part II: Methodologies for Assessing Indoor Air Exposures to Carcinogens,” Paper No. 361, Proceedings of the 97th Annual Meeting of the Air and Waste Management Association, Indianapolis, Indiana, June, 2004. Babyak, A., CE Schmidt, “Using EPA’s Dynamic Flux Chamber to Measure Vapor Flux from Subsurface Sources, Dealing with Regulatory Buy-In: Two Case Examples in California,” Paper No. 219, Proceedings of the 97th Annual Meeting of the Air and Waste Management Association, Indianapolis, Indiana, June, 2004. Schmidt, CE. A. Babyak, “Comparison of Static Chamber and Dynamic Chamber Technology for Assessing Infiltration of Soil Gas into Structures,” Paper No. 277, Proceedings of the 97th Annual Meeting of the Air and Waste Management Association, Indianapolis, Indiana, June, 2004. Schmidt, CE. E. Winegar, S. Hoyt, “A Practical Guide for the Measurement of Indoor Air Impacts from Subsurface Contamination,” Paper No. 278, Proceedings of the 97th Annual Meeting of the Air and Waste Management Association, Indianapolis, Indiana, June, 2004. Kick, R., CE Schmidt, JD McDermott , “Case Study- Assessing Potential Air Pathway Exposure to Occupants in Structures Over Groundwater Impacted by Volatile Organic Compounds Using Environmental Data Collected on Public and Private Property,” Paper No. 279, Proceedings of the 97th Annual Meeting of the Air and Waste Management Association, Indianapolis, Indiana, June, 2004. Schmidt, CE, Andrew Sheldon, Bruce Lewis, “USEPA Flux Chamber Technology and the Negative Pressure Enclosure for Assessing Potential Impacts to Occupants in Future Structures Over Contaminated Soil and Groundwater,” Paper No. 311, Proceedings of the 97th Annual Meeting of the Air and Waste Management Association, Indianapolis, Indiana, June, 2004. Greenberg, Alvin, CE Schmidt, “Direct Measured Data as Input to HRA for the Indoor Infiltration Scenario in Addition to Predictive Input,” Paper No. 352, Proceedings of the 97th Annual Meeting of the Air and Waste Management Association, Indianapolis, Indiana, June, 2004. Smyth, Brenda, C.E. Schmidt, “Air Quality Issues on Composting Horizon”, Biocycle, October 2002, PP. 42-51. Schmidt, C.E., Heriberto Robles, Teri Copeland, Jim Van de Water, Michael Manning, “Measured Infiltration Flux as the Preferred Input to Indoor Exposure Assessment,” Paper No. 70, Air and Waste Management Association Symposium on Air Quality Measurement Methods and Technology, San Francisco, California, November 13-15, 2002. Schmidt, C.E., Andrew Sheldon, “Measuring Indoor Infiltration Flux at –4Pa Underpressurizaiton,” Paper No. 72, Air and Waste Management Association Symposium on Air Quality Measurement Methods and Technology, San Francisco, California, November 13-15, 2002. Richter, Rich, Schmidt, C.E., “Assessing Realistic Risk to Indoor Occupants from Subsurface VOC Contamination,” Paper No. 69, Air and Waste Management Association Symposium on Air Quality Measurement Methods and Technology, San Francisco, California, November 13-15, 2002. Greenberg, Alvin, Schmidt, C.E., “Assessing Fugitive Air Emissions and Health Risk to Landfill Neighbors Using Direct Flux Measurement and Indoor Air Monitoring,” Paper No. 71, Air and Waste Management Association Symposium on Air Quality Measurement Methods and Technology, San Francisco, California, November 13-15, 2002. Boehnker, David, John Tiffany, Schmidt, C.E., “Estimating Exposure to Residents With Basements Using Measured Surface and Subsurface Flux Data,” Paper No. 67, Air and Waste Management Association Symposium on Air Quality Measurement Methods and Technology, San Francisco, California, November 13-15, 2002. Bejorklund, Brian, Schmidt, C.E., Robin Streeter, “Air Pathway Analysis Characterizing Potential Exposure from a Dissolved-Phase Groundwater Plume using Direct Flux Measurement,” Paper No. 64, Air and Waste Management Association Symposium on Air Quality Measurement Methods and Technology, San Francisco, California, November 13-15, 2002. Schmidt, C.E., Nancy Beresky, Steve Hoyt, “Subsurface Flux Technology Used for Site Assessment,” Paper No. 68, Air and Waste Management Association Symposium on Air Quality Measurement Methods and Technology, San Francisco, California, November 13-15, 2002. Card, Tom, Schmidt, C.E., “Measuring Fugitive Emissions from WWT Processes with Weirs,” Paper No. 78, Air and Waste Management Association Symposium on Air Quality Measurement Methods and Technology, San Francisco, California, November 13-15, 2002. Card, Tom, Schmidt, C.E., “Advantages and Disadvantages of Measuring Flux on Liquid Surfaces Using Flux Chambers and Wind Tunnels,” Paper No. 79, Air and Waste Management Association Symposium on Air Quality Measurement Methods and Technology, San Francisco, California, November 13-15, 2002. Smyth, Brenda, Schmidt, C.E., “Estimating Fugitive Emissions from Greenwaste Compost Operations Using the USEPA Flux Chamber,” Paper No. 14, Air and Waste Management Association Symposium on Air Quality Measurement Methods and Technology, San Francisco, California, November 13-15, 2002. Thalheimer, Andrew, Mark Jones, Schmidt, C.E., “Measured Flux in an Air Pathway Analysis as a Necessary Step in Site Remediation,” Paper No. 76, Air and Waste Management Association Symposium on Air Quality Measurement Methods and Technology, San Francisco, California, November 13-15, 2002. Wojnowski, Gary, Schmidt, C.E., “Calibrating Water 9 Predictive Model Using Measured Fugitive Emissions Data,” Paper No. 77, Air and Waste Management Association Symposium on Air Quality Measurement Methods and Technology, San Francisco, California, November 13-15, 2002. Schmidt, C.E., Teri Copeland, Jim Van de Water, Michael Manning, “Predicting Potential Exposure fro the Occupants in Future Buildings Using Direct Measurement and Predictive Modeling Techniques,” Paper No. 43141, 95th Annual Meeting of the Air and Waste Management Association, Baltimore, MD, June, 2002. Schmidt, C.E., Nancy Beresky, Steve Hoyt, and Jeff Dagdigian, “Differentiating Multiple Sources of Subsurface Contamination by Similar Petroleum Products- Air Pathway Analysis Used in Conjunction with Routine Multimedia Site Assessment Technologies,” Paper No. 42785, 95th Annual Meeting of the Air and Waste Management Association, Baltimore, MD, June, 2002. Sheldon, Andrew, and C.E. Schmidt, “Evaluation of an Underpressurized Emission Flux Chamber for Measuring Potential Subsurface Vapor Intrusion Into Buildings,” Paper No. 42690, 95th Annual Meeting of the Air and Waste Management Association, Baltimore, MD, June, 2002. Card, Tom, C.E. Schmidt, Jay Witherspoon, Larry Koe, “Theoretical and Practical Considerations in the Use of Wind Tunnel for Odor Emission Measurement,” Paper No. 42654, 95th Annual Meeting of the Air and Waste Management Association, Baltimore, MD, June, 2002. Card, Tom, and C.E. Schmidt, “Estimating Air Emissions from Unit Treatment Processes with Weirs,” Paper No. 43373, 95th Annual Meeting of the Air and Waste Management Association, Baltimore, MD, June, 2002. Wojnowski, Gary, and C.E. Schmidt, “Calibration of Emission Model by Flux Chamber Measurements for Emissions from Industrial Facultative Ponds,” Paper No. 43423, 95th Annual Meeting of the Air and Waste Management Association, Baltimore, MD, June, 2002. Schmidt, C.E., Jared Rubin, AIndoor Infiltration Assessments of VOCs from Contaminated Groundwater Using the US EPA Flux [email protected], Paper No. 446, 93rd Annual Meeting of the Air and Waste Management Association, Salt Lake City, Utah, June, 2000. Schmidt, C.E., et. al., “Comparison of Measured Versus Modeled Surface Flux of VOCs from Contaminated Groundwater", Paper No. 447, 93rd Annual Meeting of the Air and Waste Management Association, Salt Lake City, Utah, June, 2000. Kerger, B.D., C.E. Schmidt, and D.J. Paustenbach, AAssessment of Airborne Exposure to Trihalomethanes from Tap Water in Residential Showers and Baths", Risk Analysis, Volume 20, No. 5, 2000. Ostojic, Ned, Martha O=Brien, C.E. Schmidt, and John Chack, ARelationship Between Odor and Hydrogen Sulfide Emissions at a Water Pollution Control Plant in New York City", 2000 WEF Specialty Conference, Cincinnati, Ohio. Greenberg, Alvin, Scott Santala, C.E. Schmidt, "The Utility of the Air Pathway Analysis for Landfills", 99-728, 92th Annual Meeting of the Air and Waste Management Association, St. Louis, Missouri, June, 1999. Winegar, Eric, and C.E. Schmidt, AAnalysis Using a Jerome 631-X Portable Hydrogen Sulfide Sensor : Laboratory and Field [email protected], Report submitted to Arizona Instruments, Inc., December 30, 1998. Schmidt, C.E., Steve Wilsey, Tom Hasek Jr., "Technical Approach for the Assessment of Air Emissions from Municipal Landfills Using the US EPA Flux Chamber and Dispersion Modeling to Predict Off-site Impact Potential", 98-TA40.04, 91th Annual Meeting of the Air and Waste Management Association, San Diego, California, June, 1998. Schmidt, C.E., T.F. Zdeb, "Direct Measurement of Indoor Infiltration Using the US EPA Flux Chamber and Dispersion Modeling", 98-TA9C.01, 91th Annual Meeting of the Air and Waste Management Association, San Diego, California, June, 1998. Schmidt, C.E., John Ungvarsky, Eric Winegar, "Assessment of Ozone Precursor Emissions from the Dairy Industry", 97-MP74.01, 90th Annual Meeting of the Air and Waste Management Association, Toronto, Canada, June, 1997. Schmidt, C.E., Lawrence Hentz, Eric Winegar, "Assessment of Odorous Emissions from Composting Facilities", 97-TP56.02, 90th Annual Meeting of the Air and Waste Management Association, Toronto, Canada, June, 1997. Hentz, Lawrence, W.E. Toffey, C.E. Schmidt, "Understanding the Synergy Between Composting and Air Emissions", Biocycle, March, 1996, pp.67-75. Schmidt, C.E., et.al., "Assessment of Odor Emissions Using the US EPA Flux Chamber and Olfactory Odor Measurement," 96-FA147.04, 89th Annual Meeting of the Air and Waste Management Association, Nashville, TN, June, 1996. Schmidt, C.E., et.al., "Air Pathway Analysis in Support of Remediation of the Rocky Mountain Arsenal," 96-TP40.05, 89th Annual Meeting of the Air and Waste Management Association, Nashville, TN, June, 1996. Hentz, Lawrence, W.E. Toffey, C.E. Schmidt, "Air Emissions from Philadelphia's Biosolids Composting Facilities," A468, 89th Annual Meeting of the Air and Waste Management Association, Nashville, TN, June, 1996. Schmidt, C.E., Lawrence Hentz, E.D. Winegar, "Innovative Assessment and Engineering Evaluation of a Municipal Wastewater Treatment Facility," 96-TA29A.06, 89th Annual Meeting of the Air and Waste Management Association, Nashville, TN, June, 1996. Hentz, Lawrence H., C.E. Schmidt, E.D. Winegar, "VOC and HAP Sampling and Analytical Procedures for Wastewater Treatment Facilities," Presented at the WEFTEC '95, National Water Environment Federation, Miami, Florida, October 21, 1995. Schmidt, C.E., et. al., "Evaluation of Open Path Air Monitoring (FTIR/UV) for First Alert Monitoring, Fenceline Monitoring, and Estimating Emission Rates," 95-TP55.05, 88th Annual Meeting of the Air and Waste Management Association, San Antonio, Texas, June 1995. DeVaull, G.E., J.B. Gustafson, C.E. Schmidt, "Surface Emission Flux Measurements: Background Levels," Proceedings of the Fourth Annual West Coast Regional Specialty Conference on Current Air Toxic Issues, AWMA, November, 1994. Cohen, Y., G.E. Anderson, L.R. Chinkin, G. Pascoe, C.E. Schmidt, A. Winer, "The Valdez Air Health Study," Risk Analysis, Volume 14, No. 6, 1994. Schmidt, C.E., Michelle Simon, "How To Measure Fugitive Emissions," Environmental Protection, April 1994, PP. 47-52. Schmidt, C.E., D.A. Barton, M. Hasegawa, and T.R. Munnich, "Use of Optical Remote Sensing and Flux Chamber Technologies for Determining Emission Rates from a Pulp Mill Wastewater Treatment Facility", 94-A1044, 87th Annual Meeting of the Air and Waste Management Association, Cincinnati, Ohio, June 1994. Downs, Wayne C., C.E. Schmidt, J.C. Walton, "Comparison of Measured and Modeled Emission Rates from a Buried Waste Site", 94-A1017, 87th Annual Meeting of the Air and Waste Management Association, Cincinnati, Ohio, June 1994. Schmidt, C.E., et al, "Assessment of Municipal Solid Waste Landfill Emissions Using Optical Remote Sensing and Flux Chamber Technologies", 93-A1053, 87th Annual Meeting of the Air and Waste Management Association, Cincinnati, Ohio, June 1994. Downs, Wayne C., C.E. Schmidt, J.C. Walton, "Comparison of Measured Versus Modeled Emission Rates from Covered Landfills," Proceedings of the Fourth Annual West Coast Regional Specialty Conference on Current Air Toxic Issues, AWMA, November, 1993. Edwards. L.O., C.E. Schmidt, D. Suder, "Insight: Strategy for Developing an Emission Inventory to Determining If You Need a Title V Operating Permit:, Clean Air Permits, Tab 100, Thompson Publishing Group, July 1993, pages 319-331. Schmidt, C.E., D. Suder, W. Knuth, "Assessing Air Toxic Emissions from the Primary and Secondary Treatment of Liquid Waste from a Paper and Pulp Mill", 93-TA-30A.05, 86th Annual Meeting of the Air and Waste Management Association, Denver, Colorado June 1993. Pleus, R.C., C.E. Schmidt, D. Suder, "Methodology for Assessing the Health Impacts of Gaseous Emissions from a Pulp Mill", 93-TA-36A.05, 86th Annual Meeting of the Air and Waste Management Association, Denver, Colorado June 1993. Deeney, L.R., C.E. Schmidt, "Cost-Effective Monitoring of Hazardous Air Pollutants for Superfund Cleanup Activities: A Case Study", 93-TA-39A.02, 86th Annual Meeting of the Air and Waste Management Association, Denver, Colorado June 1993. Shen, T., C.E. Schmidt, T. Card, Assessment and Control of VOC Emissions From Waste Treatment and Disposal Facilities, Van Nostrand Reinhold Publishing, New York, New York, 1993. 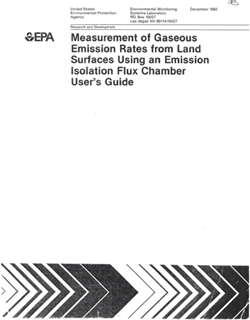 Schmidt, C.E., "Theory and Application of the EPA Recommended Surface Emission Isolation Flux Chamber- Assessment of Volatile and Semi-Volatile Species Emission Rates," Chapter 3, Sampling and Analysis of Airborne Pollutants, Eric Winegar and Larry Keith editors, Lewis Publishers, Ann Arbor, Michigan, 1993. Schmidt, C.E., "Minimizing and Controlling Air Toxic Emissions from Hazardous Waste Sites", Environmental Protection, January 1993. Kittle, P., C.E. Schmidt, "Comparison of Long Duration Foam, Synthetic Tarpaulins, Geotextiles, and Soil as Subtitle D Compliant Daily Cover Materials for Sanitary Landfills", presented at the Annual National Solid Wastes Management Association, Marina Del Rey, CA, January 1993. Kittle, P., C.E. Schmidt, “Sanitary Landfill Cover Material Compared”, Public Works, May 1993, PP. 51-52. Schmidt, C.E., "Area Source Emission Assessment Technologies", Environmental Protection, October 1992. Suder, D., C.E. Schmidt, "Comparison of Effectiveness and Costs of Various Technologies for the Reduction of VOC Technologies From Exposed Hazardous and Non-Hazardous Waste," 92-11.15, 85th Annual Meeting of The Air and Waste Management Association, Kansas City, Kansas, June 1992. Butler, W.A., C.E. Schmidt, "Air Emissions Rate Measurements of VOCs and Semi-VOCs Emitted From an In-Situ Bioremediation Pilot-Scale Test on Surface Impoundment Sludge," 1992 EPA/AWMA Symposium on Measurement of Toxic and Related Air Pollutants, Raleigh, North Carolina, May 1992. Schmidt, C.E., EPA Engineering Bulletin - Design Considerations for Ambient Air Monitoring at Superfund Sites, Draft, March 1992. 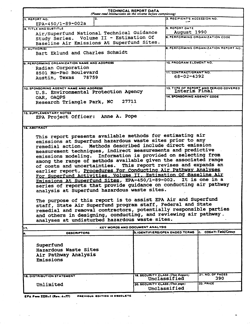 Schmidt, C.E., EPA Engineering Bulletin - Air Pathway Analysis, Draft, February 1992. Koster, Robert, C.E. Schmidt, et al, "Comparative Testing of Tedlar Bag, Solid Sorbent, and Canister Gas-Sample Collection Techniques," Proceedings of the Second Annual West Coast Regional Specialty Conference on Current Air Toxic Issues, AWMA, November, 1991. Schmidt, C.E., Editor, EPA Engineering Bulletin - Control of Air Emissions From Materials Handling During Remediation, EPA/540/2-91/023, October 1991. Schmidt, C.E., Nancy Stein, Raj Rangaraj, "Development of an Engineering Approach for the Remediation of a Petroleum Sump and the Measurement and Modeling of Air Emissions from the Remedial Approach," 91-91.6, 84th Annual Meeting of the Air and Waste Management Association, Vancouver, B.C., June 1991. Berry, R.S., C.E. Schmidt, R.C. Wells, "An Evaluation of Sampling Strategies for Determining Soil Filter Control Efficiencies," 91-17.4, 84th Annual Meeting of the Air and Waste Management Association, Vancouver, B.C., June 1991. Schmidt, C.E., Nancy Stein, Raj Rangaraj, "Estimating Air Emissions From the Remediation of a Petroleum Sump Using Direct Measurement and Modeling," Proceedings of the 1991 EPA/AWMA Symposium on Measurement of Toxic and Related Air Pollutants, Raleigh, North Carolina, May 1991. Suder, David, Anne Wooster, C.E. Schmidt, “Comparison of Measured To Modeled Emission Rates at an Active Hazardous Waste Landfill”, 90-82.6, 83rd Annual Meeting of the Air and Waste Management Association, Pittsburgh, Pennsylvania, June, 1990. Schmidt, C.E., W. Faught, "Review of Direct and Indirect Emission Measurement Technologies for Measuring Fugitive Emissions From Wastewater Treatment Facilities." 1990 Summer National American Institute of Chemical Engineers, San Diego, California, August, 1990. Boyd, R.R., J.L. Balzer, C.E. Schmidt, L.O. Edwards, "A Multi-Media Environmental Assessment of Emissions From a Large, Biomedical Research Facility." 90-131, 83rd Annual Meeting of the Air and Waste Management Association, Pittsburgh, Pennsylvania, June, 1990. Shen, T., C.E. Schmidt, T. Nelson, "Chapter 20, Land Disposal," AP-40, EPA Publication, Date Not Determined, Submitted June, 1990. Schmidt, C.E., D. Suder, "Development of a Technical Approach for Determining the Volatilization Rate of Hydrocarbons From a Landfill Using Both Modeling and Direct Emission Measurement Techniques." Proceedings of the 1990 EPA/AWMA Symposium on Measurement of Toxic and Related Air Pollutants, Raleigh, North Carolina, May, 1990. Shen, T., C.E. Schmidt, T. Nelson, "Assessment and Control of VOC Emissions From Waste Disposal Facilities," Volume 20, Issue 1, CRC Press, Inc., January, 1990. Schmidt, C.E., L.O. Edwards, J.L. Balzer. "Technical Approach for Conducting an Air Emissions Assessment at a Large Facility With Multiple Point Sources." Proceedings of the 1989 EPA/AWMA Symposium on Measurement of Toxic and Related Air Pollutants, Raleigh, North Carolina, May 1989. Schmidt, C.E., and M. McDonough, "Guidance Document on Air Pathway Analysis and Estimating Emission Rates for Air Contaminants From Hazardous Waste Sites." Proceedings of the 1989 EPA/AWMA Symposium on Measurement of Toxic and Related Air Pollutants, Raleigh, North Carolina, May 1989. Schmidt, C.E., and R. Vandervort. "Gas-Phase Sampling Techniques and Procedures Used to Assess an Underground Liquid Hydrocarbon Plume on Groundwater. Technical Paper and Presentation." 81st Annual Meeting of the Air Pollution Control Association, Dallas, TX, June 1988. Schmidt, C.E., R. Larsen, S. Quan. "A Technical Approach for Designing Air Monitoring Programs for Site Mitigation." 81st Annual Meeting of the Air Pollution Control Association, Dallas, TX, June 1988. Schmidt, C.E., C.C. Mecham, M.T. Galloway, "The Importance of Proper Site Characterization Work Supporting Hazardous Waste Management Activities", Proceedings of the 1988 Hazmacon Conference, Anaheim, California, April 1988. Clark, J.A., C.E. Schmidt, T.D'Auanzo, "Area Source Emission Assessment for Air Toxics," Proceedings of the 1988 Hazmacon Conference, Anaheim, California, April 1988. Schmidt, C.E., C.C. Mecham, M.T. Galloway, "The Importance of Proper Site Characterization of the Air Contaminant Pathway, "Proceedings of the 1988 EPA/APCA Symposium on Measurement of Toxic and Related Air Pollutants, Raleigh, North Carolina, May 1988. Schmidt, C.E., G. Turl, R. Stephens, "Control and Monitoring of Air Contaminants During Site Mitigation." Proceedings of the 80th Annual Meeting of the Air Pollution Control Association, New York, New York, June 1987. Rouge, J.D., C.E. Schmidt, J. Hicks, "Hazardous Materials and Waste Tracking System," Proceedings of the 80th Annual Meeting of the Air Pollution Control Association, New York, New York, June 1987. Balfour, W.D., C.E. Schmidt, B.M. Eklund. "Sampling Approaches for the Measurement of Volatile Compounds at Hazardous Waste Sites," Journal of Hazardous Materials, 14 (1987), PP. 135-148. Johnson, A.S., C.E. Schmidt, R. Vandervort. "Indoor Air Sampling for Volatile Organic Compounds Associated with Environmental Contamination," Proceedings of the Third Annual Hazardous Materials Management Conference and Exposition, Anaheim, California, April 1986. Schmidt, C.E. "Developing Site-Specific Ambient Monitoring Programs for Hazardous Waste Sites," Instructor for the University of California, Davis, Extension Program, Air Pollution and Toxic Chemicals, Davis, CA, July 1985. Schmidt, C.E. and J.K. Meyer-Schmidt. "Assessment, Monitoring, and Modeling from a Superfund Site Remedial Action," Proceedings of the 78th Annual Meeting of the Air Pollution Control Association, Detroit, MI, June 1985. Schmidt, C.E. and D.L. Gordy. "Designing Air Monitoring Programs for Remediation at Hazardous Waste Sites," Proceedings of the 78th Annual Meeting of the Air Pollution Control Association, Detroit, MI, June 1985. Schmidt, C.E. "Measurement of Organic Fugitive Emissions from Area Sources," Presented at the Annual Engineering Foundation Conference, Santa Barbara, CA, March 1985. Vandervort, R., C.E. Schmidt, W.D. Balfour. "Surface and Subsurface Gas/Vapor Monitoring Techniques Applied to Environmental Contamination Caused by Petroleum Products and Processing Waste," Proceedings of American Petroleum Institute Committee Meeting on Safety and Fire Protection, San Antonio, TX, September 1984. Balfour, W.D. and C.E. Schmidt. "Sampling Approaches for Measuring Emission Rates from Hazardous Waste Disposal Facilities," Proceedings of the 77th Annual Meeting of the Air Pollution Control Association, San Francisco, CA, June 1984. Schmidt, C.E., W.D. Balfour, and R.D. Cox. "A Direct Emission Sampling Technique for Measurement of Toxic Gaseous Contaminants," Presented at the National Conference on Environmental Engineer, Boulder, CO, July 1983. Schmidt, C.E. and R.D. Sacks. "Characterization of a Hybrid Flame/Arc Excitation Source Using Monodisperse Aerosol Introduction," Spectrochimice Acta, Vol. 38B, No. 4, pp. 557-571, 1983. Schmidt, C.E. "Operation of a Mobile Aerosol Reaction Chamber," Presented at the American Association for Aerosol Research (AAAR), Santa Monica, CA, 17-19 February 1982. Schmidt, C.E., "Optical Emission Spectroscopy of Uniform Aerosol Droplets in a Hybrid Flame/Arc Excitation Source," Ph.D. Dissertation, University of Michigan, Ann Arbor, Michigan, 1980. Schmidt, C.E. and R.D. Sacks, "Comparative Study of Plasma Generators for DC Arc Emission Spectroscopy," 1978 FACSS Convention, Boston, MA, 1978.